Managing risk in the 20th Century was about how to adapt the physical infrastructure to mitigate loss of life and property. Managing risk for the 21st Century is about connectivity. Now we must ensure systems are secure and connected, so data can flow freely between all users of the transportation network. 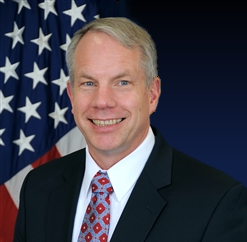 Tom Gebhardt serves as Chairman and CEO of Panasonic Corporation of North America, a leading technology partner and integrator to businesses, government agencies and consumers across the region. The Newark, NJ-based company is the principal North American subsidiary of Osaka, Japan-based Panasonic Corporation and the hub of Panasonic’s U.S. branding, marketing, sales, service and R&D operations. In addition to leading North American operations, Tom also serves as an Executive Officer of Panasonic Corporation, and is responsible for formulating and executing Panasonic global business strategies. With Panasonic for more than 30 years, Tom previously led Panasonic Automotive Systems Company of America to become the largest and most dynamic of Panasonic’s North American businesses. He has also served as President of Panasonic Industrial Company, President of Panasonic Factory Solutions Company, and General Manager of Panasonic Battery Group. Tom also serves as a Director on the Boards of Hussmann (A Panasonic Company), Cedar Electronics Holding Corp and New Jersey Performing Arts Center.